VATICAN CITY (CNS) — Parents must not exclude themselves from their children’s lives and, despite what some “experts” may say, they must take an active role in their children’s education, said Pope Francis during his general audience in St. Peter’s Square May 20. “It’s time for fathers and mothers to come out of their exile — because they have exiled themselves from their children’s education — and to fully assume again their educational role,” he said. But, faced with numerous experts who tell them how their children should be raised, many parents have withdrawn their involvement in their children’s education, and this is “very grave,” he said. The result is a “divide between families and society, between families and schools,” he said. “The educative partnership between society and family is in crisis because mutual trust has been undermined,” the pope said. Tensions and disagreements between parents and teachers are a symptom of the crisis, he said, and children bear the brunt of it. Parents then “tend increasingly to entrust to the ‘experts’ even the more delicate and personal aspects of their children’s lives, setting themselves off alone in a corner,” he said. In trying to demonstrate how “things have changed,” the pope told a personal story about when he said a bad word to his fourth-grade teacher, who promptly called his mother. When his mother came to school the next day, she made him apologize to the teacher and then disciplined him when he got home. Today instead, he said, parents will reprimand a teacher who tries to discipline their child. The pope said it is obvious the current situation is “not good” or “harmonious,” since it tends to put families and schools in opposition rather than in collaborative relationships. The advice the apostle Paul gives to both children and parents in his Letter to the Colossians — that children obey their parents in all things and that parents not exasperate their children by “commanding in a bad way” so as not to discourage them — is “a wise rule,” he said. 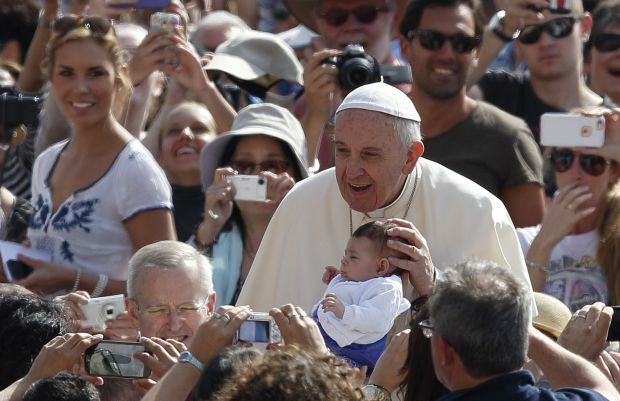 To exasperate a child is to ask them to do things they are not able to do, the pope explained. Rather, children must be accompanied and “grow without being discouraged, step by step,” he said. He also exhorted families to practice patience. “Wonderful” Christian parents “full of human wisdom” demonstrate that good education in the family is the “spine of humanism,” he said. Their “radiance compensates for the gaps, wounds and voids of fatherhood and motherhood” that many children experience, he added.